Summer is in full swing – and that means lots of seasonal celebrations! In my ideal world ever day would be a party. Since fancy cocktail and dinner parties don’t happen every night at our house, when it comes time to prep for a special occasion I tend to go all out – down to the smallest details. Big groups, or the more intimate affairs, I want every aspect to feel authentic and have an organic excitement to it! Planning a summer soirée? How do you prep for celebrations? I have multiple up-and-coming events that I am hostess for. I thought it would be fun to share how I scheme up ideas for our get-togethers, big and small. First thing first – my end goal is always for everyone to have FUN and keep it EASY! (Followed by deciding what to wear!) I have literally planned whole parities around an outfit – haha. A theme doesn’t have to be obvious – for example, when planning our wedding (coming up on our 7 year anniversary whaaaaat!) I used “Breakfast at Tiffany’s” as my subtle inspiration. I also love a simple floral motif or color scheme (for my daughters 1st birthday we did gold and shades of pink.) One of my favorite parties was a 1920s dinner party we threw for one of my 20-year birthdays. It’s amazing how having a vibe can make a bash feel cohesive and thoughtful. Although mine usually turn into some sort of “champagne campaign” lol. Mimosa bars just work --and add an easy bit of effervescent liveliness. I've had this whole *spiked lemonade* party planned out in my mind, and keep buying things for it – (AKA anything with a lemon on it – have you seen this post?) When life gives you lemons…. you share them with your friends! (In the form of spiked lemonade that is.) File this under charming and whimsical outdoor entertaining. Always looking for an excuse to share a cocktail with good company! Anyways, I guess all I need to do it set a date? When it’s time for a seasonal entertaining I’m all about creating an atmosphere – it’s so important to set the mood. Here are a few tips and ideas on making your next outdoor soirée one to remember. Once you decide to have a party, birthday, special occasion, or low-key get-together, you need an invite list. I am not a numbers girl, but for parties having a head count is numero uno. Once you have a number in mind you can set a budget and plan food, drinks, location. An invite that is customized can tell your party-goers everything they need to know – what to wear and what to expect. Food? Drinks? Dancing? Entertainment? When it comes to inviting your guests, do you use paper invites or do you prefer to use apps or online invitations? Paperless Post reached out to me, and I am infatuated with their gorgeous prints! Since exploring their site, I am convinced digital invites are the way to go! For one, it’s a HUGE money and time saver! I know you are all looking for ways to save time and money. Plus, it’s a great way to go green, which is always a smart move. I lean sentimental, but I think a lot people toss out cards after giving them a quick glace. 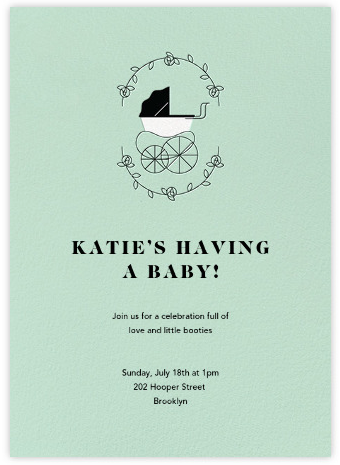 Digital invitations/cards are a relatively new idea, but more and more people have started to use them for weddings, baby showers, bachelorette parties, birthdays, holidays, and other occasions. Here are a few favorites from their site! Here’s the run-down. Paperless Post carries multiple high-end designers, such as Kate Spade, Rifle Paper Co. (one of my all-time favorites! Have you seen this dress post?) Charlotte Olympia, Liberty Fabrics, Kelly Wearstler, Sugar Paper LA (I love their wrapping paper seen in this post.) I love when fashion and print worlds collided, as it usually equals creative clever charm. Let your imagination run wild– you can custom create your invite or greeting card to say whatever you want, without having to design the actual graphic or print. (Which is not my strong suit. I’m much better at mixing colors and patterns.) Their layout tools are really easy to use too! 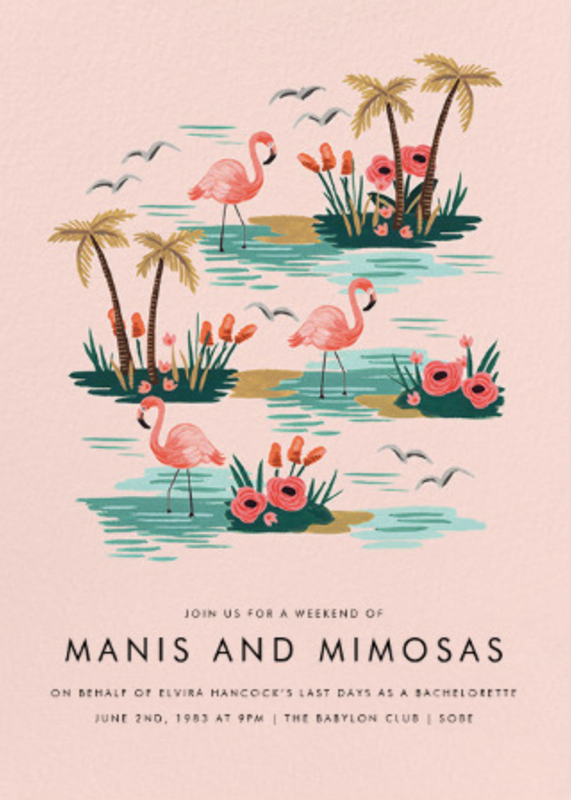 First, you pick your invite (and good luck narrowing it down – sooo many darling options!) Some digital styles come at a cost, and some are free. Next, you can customize your font, the envelope liner, and response card. There is a “preview” option for each design, so you can see what your guests will experience as they unveil their digital mail. What an awesome and practical option for weddings, kids birthday parties, cocktail parties or even a surprise party! They also have amazing greeting cards, stationary, and thank you notes! This part makes me giddy with excitement! I love to decorate, and add little touches to make the fest just that – festive! Fun paper straws, flowers, a custom drink of the night, music. Gather all your supplies as you plan ahead and keep them in a bin, so when the time comes all you need to do is grab your scissors and tape! If you are like me, you like to capture a few shots of your pretty little details and set up before your guests arrive! It’s fun to show off your creative handy work and maybe inspire someone else along the way. I love my Instax Mini 8 for adding nostalgia to the night and giving guests a little take-away in the polaroid form. Nothing notes a memory a like photograph. For a light picnic, BBQ or clam bake, take into account your gusts food preferences, allergies, and dietary needs. Make sure to provide a mix of options. Fruit, veggies and a main dish. I love a decadent dessert spread and if someone offers to bring something take them up on it! Make a playlist, or I love to put on some Ella Fitzgerald or Billie Holiday or a Lumineers channel on Spotify. At home we use the record player and mix it up. Keep it light, and as the night goes on play somehting that will make your guests want to sing along or maybe have a triwl. I have a bunch of friends who do know how to strum a guitar, so tell them to bring it along! Make sure to supply options for the non-drinkers, but hopefully most are down for some "spiked lemonade in the glade," "rosé on the roof," or whatever else you want to throw out there as a party drink theme! Bring blossoms to your host when you attend a soirée, and use them to decorate when you are hosting the soirée! Take into account the weather. Make sure your gusts are comfortable. Provide fans, if it’s a hot day (this shoot was soooo humid! ), seating, mood lighting, have some sort of entertainment planned. We usually end up playing games aka Cards Against Humanity and sometimes Rob will set up a DIY photo booth. Pluck a flower in your hair and be done! Add a hat, shades and a jumpsuit covered in fruit – haha ok I get not everyone is going to wear what they are serving at the party, but as hostess I say let yourself shine! Go out and get a special dress or if that’s not your thing, put on your favorite laid-back tee. Your guests want to see that you are relaxed and comfortable, you really set a lot of the feel for the night. If you are running around frantic your guest are going to pick up on it. Most importantly, have FUN! Otherwise – what’s the point?! When it comes to hosting a special night, just know the juice is worth the squeeze my friends! A special thank you to Paperless Post for collaborating on this post!